Most childhood dreams include living in a two-storey homes with four bedrooms, a huge average room size, multiple cars, and a big lawn they can roll around in. Just like what we see in the movies. But as we grow older, we realise how impractical it can be not only because having that many rooms can be hard to clean, but also because of the home loan and interest rate that come with it. Still, wouldn’t it be nice to have your own house with a garden and a kitchen to die for? Dreaming is free, but let’s be realistic for now and talk about the average home size we have here in Australia and where we are in the world ranking. Trends show Australians choosing to live in smaller sized homes and in apartment units because of its distance to the city and amenities, as well as the comfort it brings. 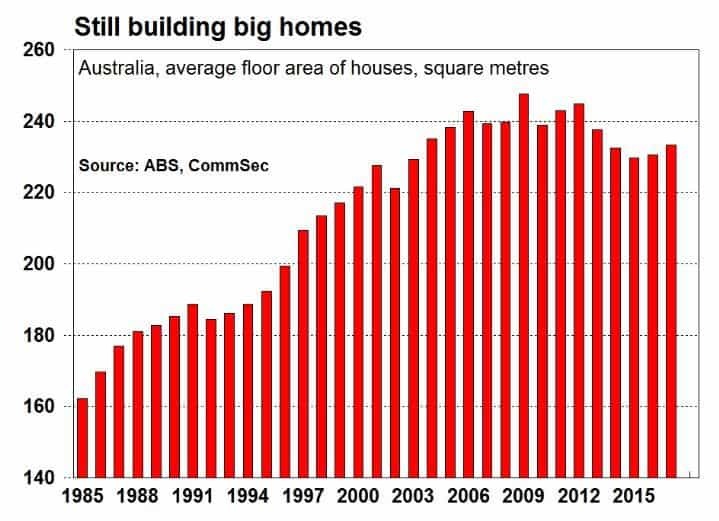 Today, the average new home and apartment size in Australia is now at 189.8m2 in square meters, which is the smallest being built since two decades ago. In reality, this statistic is distorted and houses aren’t really getting that much smaller, but there are more and more apartments are being built and occupied by Australians. In fact, it accounts up to 47% of new houses being built, which is 27% more compared to just seven years ago. The Average standalone new house size being build is 233m2 in square meters. This size has not varied significantly in the past 20 years and can be seen the the bar graph below. What is the average size of a 3 bedroom house? According to Australian Bureau of Statistics, the most common house configuration in Australia is a three bedroom house making up 38.8%. Therefore, it is safe to assume the average size of a new 3 bedroom house in Australia is about 175m2. However, older homes in Australia were generally smaller, so existing 3 bedroom homes will be significantly smaller. This chart below shows the average % of each house bedroom configuration in Australia from 2016. Victoria and Perth are currently on top of the list with newly built homes at 242m2. Queensland follows at 227m2, and New South Wales at 230m2. Tasmania and ACT have the smallest houses at 195m2 and 197m2, respectively. Let’s not forget about apartment size. Even though it’s no surprise that Sydney has more apartment dwellers, Melbournians live in bigger apartments at 131m2, compared to Sydneysiders at 129.50m2. We used to be on the top list of biggest housing floor plans but with the increase in demand of apartment units, the average Australian floor plan decreased to 233m2. This puts us behind United States with their free-standing homes being at 249m2. Just five years ago, we were at par with them and Australian homes are still more spacious compared to other western and developed countries like Denmark (137m2) and Canada (181m2). You can see the house size based on data from census.gov. Even with decreasing floor area, we should still be thankful to the space we have available. 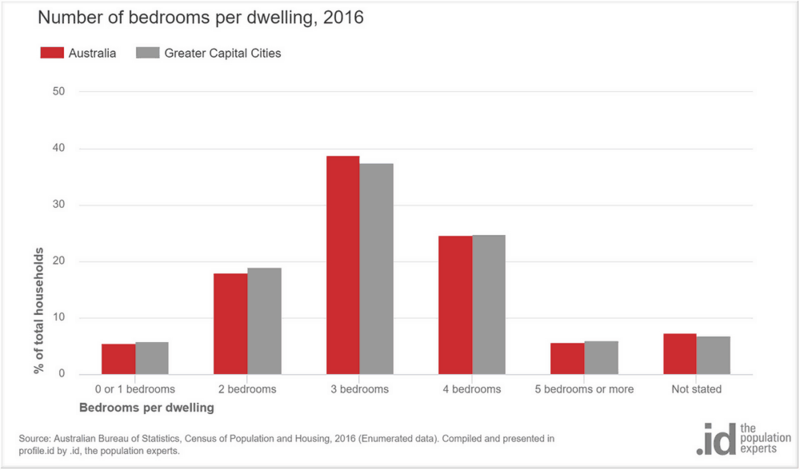 In Hong Kong, with a population density of 6300 people per km2, people live in micro apartments and small houses with an average floor area of 43.6m2. Because of so many people in just such a small space, they don’t have the luxury of living in bigger units and free-standing homes like we do. Statistics show that on the average, at least 70% Australians still choose to reside in detached houses with at least three bedrooms, and a double garage. Average block size is around 474m2, according to National Land Survey Program. Less than 10% live in townhouses or terraces, and unsurprisingly, more than 25% of Sydneysiders choose to live in units and apartments. Maybe it’s because of the distance from the city and amenities, accessibility to public transportation, or smaller space to clean and maintain. No matter what the reason is, each to their own, right?